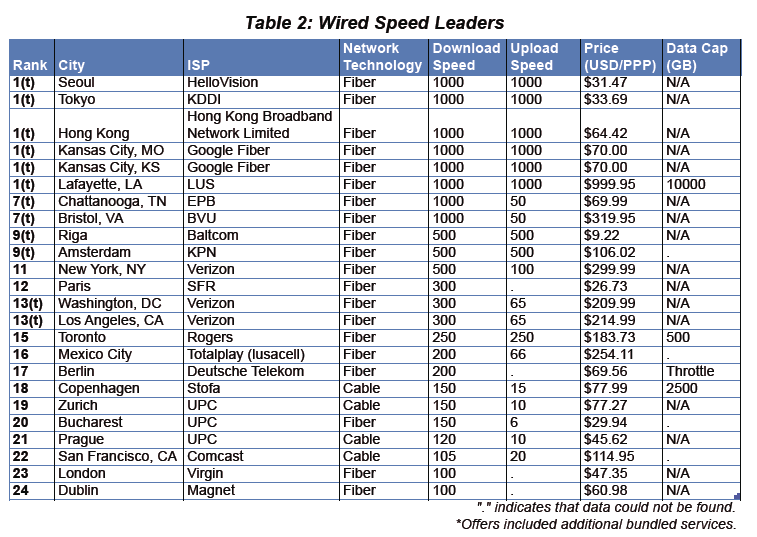 A new study confirms what you might have expected: US customers are getting hosed when it comes to broadband speeds and prices. The annoying trend holds true in both wired and wireless service. 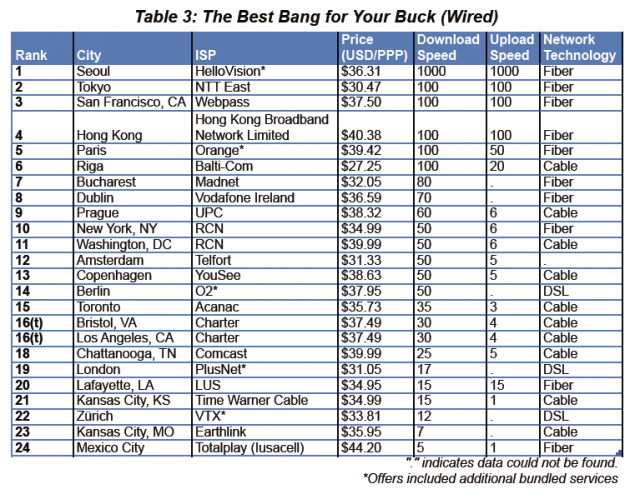 In the Cost of Connectivity 2013 report being released today by the New America Foundation's Open Technology Institute, researchers note that "in larger US cities, we continue to observe higher prices for slower speeds… In the US for example, the best deal for a 150Mbps home broadband connection from cable and phone companies is $130/month, offered by Verizon FiOS in limited parts of New York City. By contrast, the international cities we surveyed offer comparable speeds for $77 or less per month, with most coming in at about $50/month. 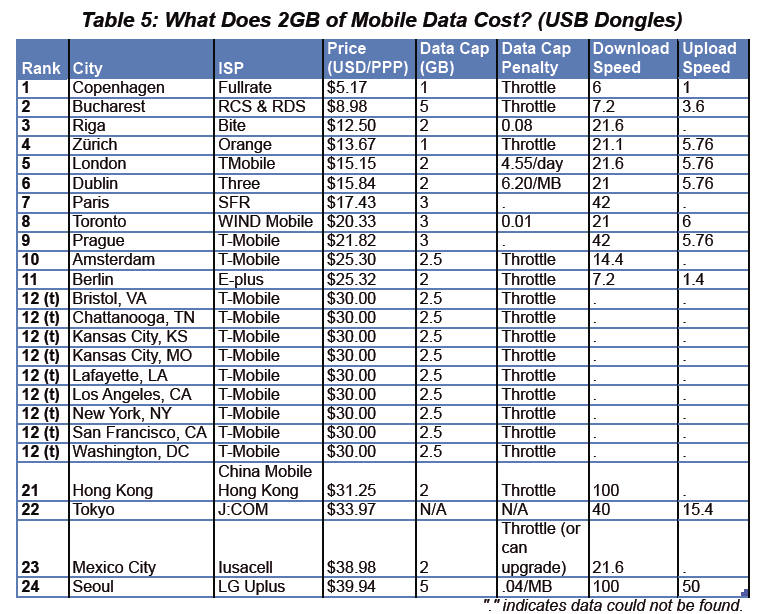 When it comes to mobile broadband, the cheapest price for around 2GB of data in the US ($30/month from T-Mobile) is twice as much as what users in London pay ($15/month from T-Mobile). It costs more to purchase 2GB of data in a US city than it does in any of the cities surveyed in Europe." The analysis compares costs across countries by using purchasing power parity exchange rates. 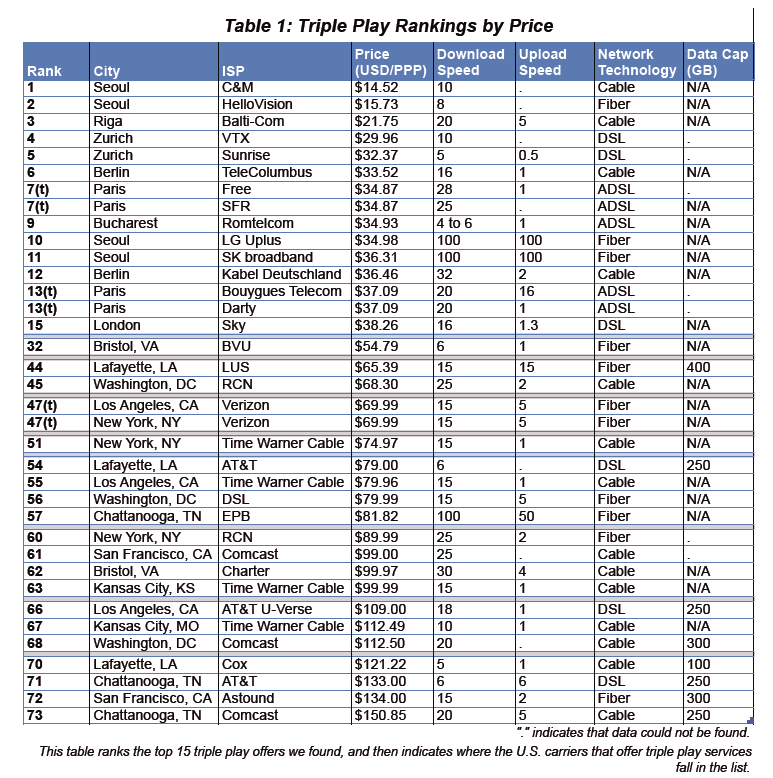 "We selected a number of cities that ranked highly in surveys of Internet speeds, including many at the top of the list in the Akamai report, as well as major cities with relatively similar population sizes and densities," the New America Foundation wrote. "We also chose to include three smaller US cities which have municipal broadband networks: Bristol, VA; Chattanooga, TN; and Lafayette, LA. These cities currently offer some of the fastest Internet connections in the US because the local communities have invested in and built their own communications infrastructure." There are much better deals in the US than what made it into the report. But these deals are often found in small cities. Residents of Springfield, VT and surrounding towns can purchase gigabit speed for $35 a month, and numerous other cities and towns have gigabit connections in the $70 range. Google Fiber customers can get a gigabit up and down for just $70 a month as well. 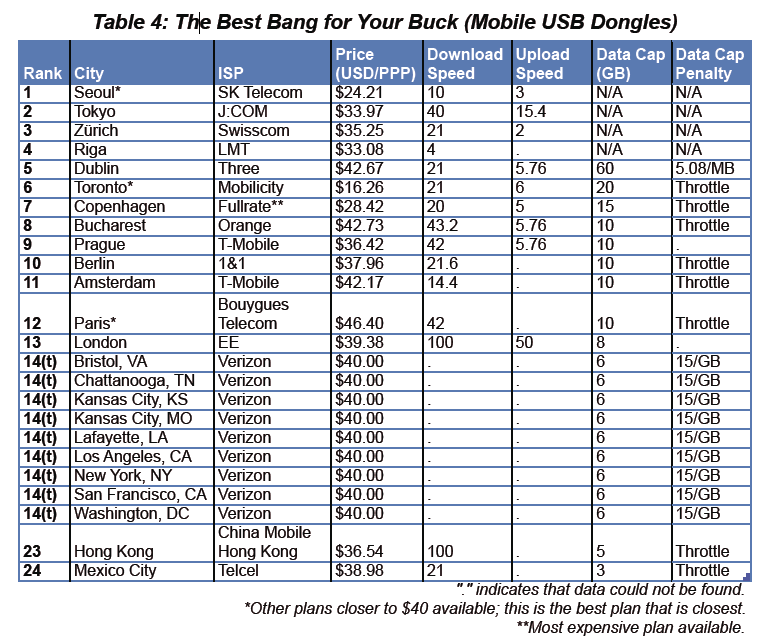 On the wireless side, the Cost of Connectivity report examined data-only mobile Internet plans, "which typically utilize a USB-based 'dongle' modem. We do not include mobile data services that are part of a combined voice and data subscription plan." "T-Mobile offered the best deal among the US providers, but it still placed 12th in our rankings behind all of the European cities surveyed," the report said. 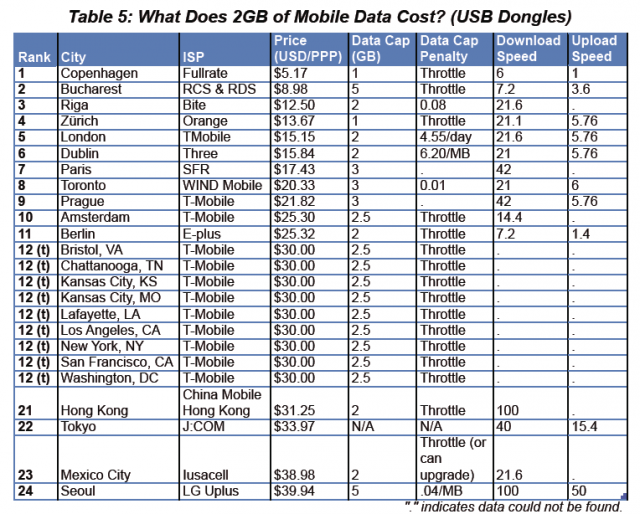 "China, Japan, Mexico, and South Korea fell lower than the US cities, although it must be noted that the Japanese provider offers an unlimited plan, while the lowest available data cap in Seoul is 5GB. Moreover, the providers in Asian cities offered base packages with much faster speeds—100Mbps download in Hong Kong and Seoul—than any of the other providers included in this ranking." In the US, wireless providers are increasingly monetizing data caps by charging users for any data they use beyond their limit. Internationally, "most providers throttle users instead of charging for data overages," the report said. "Last year, for example, Verizon switched from throttling to charging for data overages, leaving T-Mobile as the only US provider which throttles rather than charging steep overage fees." What's the takeaway from all this data? It's not a surprising one: lack of competition makes for bad choices. 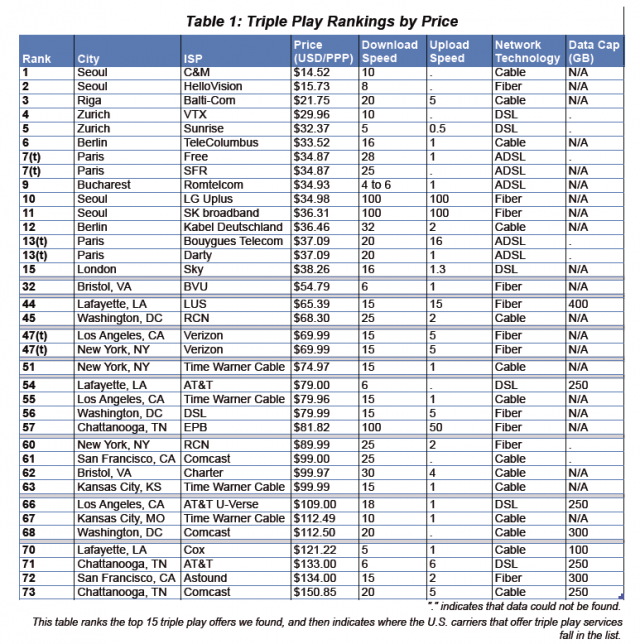 "[T]the most affordable and fast connections are available in markets where consumers can choose between at least three competitive service providers," the report said. The New America Foundation plans to follow up next month with a more extensive report that will "analyze the roots and impact of high costs and low speeds in the United States" and offer policy recommendations.